It was May 8, 1733, when two quarrymen, Anders Halfwarder and Olof Sigräfwer, reported excited to the master builder Johan Gråberg, who was inspecting the quarry of Nybro situated near the village Wamlingebo on Gotland, of a very strange discovery: While cutting large blocks of sandstone (today referred as the Silurian Hamra-formation) for construction purpose, Halfwarder spotted a frog sitting in the middle of a large boulder he just cut in two, more than 3 meter below the actual surface. Gråberg followed the two men and found a grayish black frog, strangely lethargic - it reacted barely to the contacts with a spade or stick, closing its eyes, and its mouth was covered with a yellow membrane. Finally Gråberg lost his patience and beat the creature to death with a heavy shovel - the quarrymen deposited the cadaver in their cabin. Later in the afternoon Gråberg repented his inconsiderately act "for being the Slayer of that extraordinary Animal, which might have lived for many hundreds of years within its stony Prison", recovered the body and brought him to Stockholm. Gråberg contacted various scholars and finally the physician and self-declared naturalist Dr. Johan Phil got interested in the case. 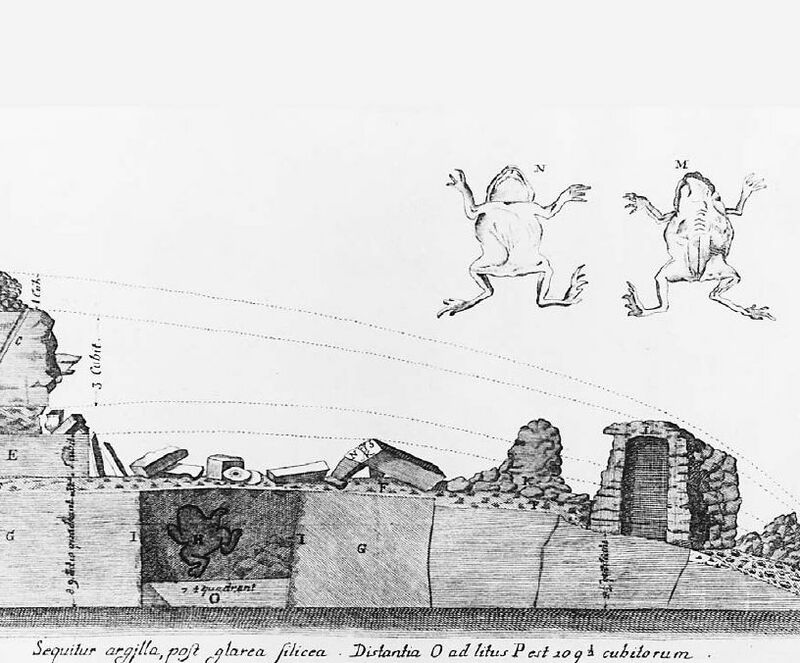 Phil developed a theory proposing that frog-spawn had entered in some way the rock and developed over the following years into a fully grown frog, the 39 pages long paper presented to the Swedish Academy of Sciences was however rejected during a meeting in November 1741 and put in the archives of the Academy. Only an excerpt containing the account by Gråberg and an engraving showing a section of the quarry and the frog was published in the Transactions of the Academy. Fig.1. 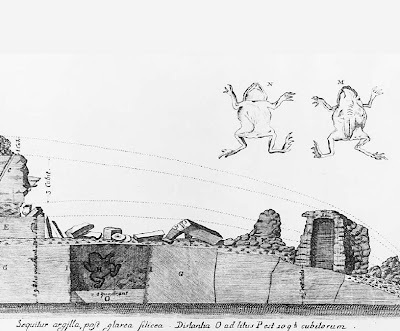 The 1733 drawing by Gråberg's from the frog and a cross-section of the quarry of Nybro. Soon the Swedish original text was translated in German, Dutch, French and Latin. The frog of Nybro was treasured in the natural history collection of Count Carl Gustaf Tessin at Akerö Castle until 1760, today this specimen is lost. The reluctant behaviour of the Academy to the presumed discovery of the frog was not too surprisingly, despite a general interest in strange phenomena animals surviving in rocks were regarded with great suspicion - the interest resulted more in the intent to disprove such claims. Stories of entombed animal were already known for centuries, reported mostly from England or France and it was said that the German Count Fürstenberg possessed in 1664 even a rock in which audibly a frog croaked. Carl Linnaeus considered it possible that amphibians could live for centuries enclosed in stones. In 1818 the mineralogist E.D. Clarke (1769-1822) reported during a lecture hold at Cambridge University about the discovery in Cretaceous rocks of three living specimen of an previously extinct believed salamander species - supporting the idea that the animals were enclosed in rocks for geologic periods. 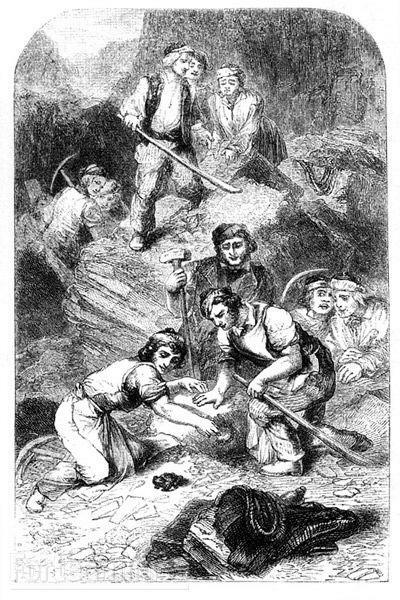 In the first half of the 19th century the "toad in the hole" became very popular in Victorian England, many books about regional geology - like "A delineation of the strata of Derbyshire" - mention not only fossils in various strata but also the discovery of living frogs or toads inside compact rocks (however the animals - so the text- died almost immediately). It apparently became a challenge to Victorian amateur naturalists to discover these animals entrapped in stone. Various hypothesis were formulated to explain the toad in the hole - the work of the devil, spontaneous generation, animals entrapped during the biblical flood or more probable a small frog that entered the rock by fissures handled to survive by sporadic insects entering his hideaway until he grow to large to again left his prison. Professor William Buckland, notorious for his interest in strange geologic phenomena, decided to test the last hypothesis in an experiment. He sealed 24 toads in niches carved from one block of limestone and one block of sandstone and buried them for one year in his garden. In December 1826 the two blocks were dug up and examined. All the toads in the sandstone block were dead and decayed; surprisingly in the porous limestone some toads were still alive, two of them had even gained weight. Buckland however noted that the seal of the prison of the surviving animals were damaged; in a second run this time with intact seals no animal survived the experiment. Buckland considered the results as proof that toads couldn't survive longer periods sealed off from oxygen, water and nourishment - the scientific establishment regarded therefore the toads in the holes as closed case. 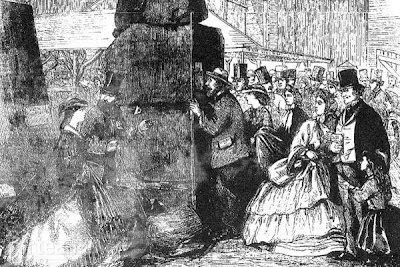 In 1862 in a letter to the Times the physician and author Frank Buckland and palaeontologist Richard Owen protested against the public display of a frog coming from the Welsh coal mine of Cwm-Tylery. During the International Exhibition in London (inspired by the original 1851 Great Exhibition) a section was devoted to the geology and palaeontology of England and Wales and one of the most famous specimen was a frog found apparently entombed in a block of coal. Fig.2. The block of coal with the Cwm-Tyler frog being admired at the International Exhibition, from the Penny Illustrated Paper of 23, August 1862. Buckland studied the young and vivacious animal and concluded that if it was not already a fake it was more probable that the animal had entered the mine and became entrapped recently in the rock during the process of mining. Buckland and Owen stated that displaying this faked toad damaged the reputation of the entire exhibition - the frog was not removed but the letter prompted an intense debate about the veracity of such findings in the newspaper. To Richard Owen were send so many third hand reports, anecdotes and even specimens of amphibians found in rocks that he enervated handled the business over to his wife - obvious he didn't consider the cases to be serious (and Caroline Owen managed to expose at least one of the amphibians as a fraud). Fig.3. A toad-in-the-hole discovery in a fanciful illustration by Philip Henry Gosse in his "Romance of Natural History". In the second half of the 19th century discussion, discovery and interest of toads enclosed in rocks soon diminished. The last prominent specimen was reported from the U.S. in the early 20th century with the case of "Old Rip" found in Texas in the year 1928. Here a horned toad supposedly survived 31 years entombed in a cornerstone of a courthouse. The liberated toad became the star of a freak show (and later of a Bugs Bunny Cartoon). Despite the notoriety of these phenomena and more than 210 historic or recent reports of toad in the hole published repeatedly in mystery mongering books, Tv-shows and websites there is no physical evidence that they ever existed. Many descriptions of such cases came at best from second or third hand experience, newspaper at the time feed the interest of the general public by reprinting again and again old stories or inventing new ones. Many toads were suspiciously found by clergyman who used them as evidence to discuss the formation of rocks by a biblical flood or a divine intervention. The few studied examples were exposed as hoax already at the time of their presumed discovery and the only specimen that survives until today, hosted in the Booth Museum of Natural History in Brighton, was donated to the museum by amateur naturalist Charles Dawson in 1901 - a name notoriously connected to the Piltdown-Man fraud. Ive note got my notes to hand but I am sure this subject occurs at length in relation to a number of subjects including kidney stones shaped like pistols and transforming fish that look like monks in Edward Lhuyd's's letter to John Ray in which he unleashes his "preternatural" theory of fossils on the world. That the fossil is formed from fish sperm in heavy mist at sea, forms into stone and is driven far into the earths crust. Its a rather interesting account. Its in Latin but there is an English translation in print. Gunther, R.T. 1925. Early Science in Oxford. Vol. III. Part I. The biological sciences. Part II. The biological collections. Gunther, R.T. 1945. Early Science in Oxford. Vol. XIV. Life and letters of Edward Lhwyd. Did not note which one when I read them. Letter is a classic. Enjoy!